In the show, they highlight the works, made by Sanz and Zapata, with the title 'The withered flower', 'What I love About You' (What I love you) or 'The Royal Family' (The Royal Family), valued between $ 5,000 and $ 65,000 . Without a doubt, especially the last one, it is destined to attract the attention of the Spanish public, because it gives the impression that it portrays the tensions of the Spanish Royal Family . "The collaboration produces interesting artistic works, and particularly what Sanz and Zapata have created together evokes the spirit of Picasso and Condo, " says Philippe Hoerle-Guggenheim. In this way, he compares Sanz and Zapata, who met through Vicky Martín Berrocal , with Picasso and George Condo, a contemporary American artist, known for his recontextualized figurative works of Old Masters fused with the techniques of Pablo Picasso and Willem de Kooning. 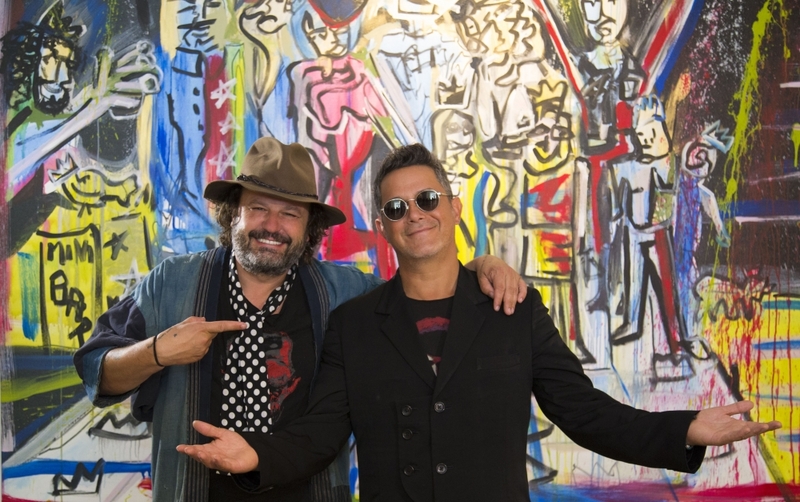 "I am very happy to host this innovative exhibition, with a renowned musician, which is a work of art in itself, he expresses himself in a very pure way on the canvas, " emphasizes Alejandro Sanz's gallerist, who exhibits in a week that is marked in red in New York. It is when the important Frieze art fair takes place. Meanwhile, in a few days, large auctions are held at Christies and Sothebys, where works by Picasso , the highest valued at 70 million, and a portrait of Amedeo Modigliani, which is expected to reach 150 million , are on sale. of dollars in the bids. Zapata, who began to speak with Sanz about this collaboration two years ago, emphasizes that "we have had a great time and I hope that everyone enjoys it, that we have done that". Meanwhile, Sanz, with more than 20 Grammy and Latin Grammy awards, responds on the social network Instagram to a thank-you note from the artist: "Thank you dear teacher, an honor to share with you the passion for life . I get excited every time I see you painting. " In this way, gallerists explore new market formulas with big names from other artistic fields, due to the economic pressures in New York due to the high prices of the rents of their spaces and the insurance of the works. In this case, Philippe Hoerle-Guggenheim proves with Sanz, success in the world of music, which must now prove if it is also profitable for the New York art world with the sale of these acrylic pieces on canvas. After the commotion of journalists, especially Spaniards and Latin Americans, the gallery owner is interested in hearing the opinion of collectors. Above all, these days, it is important for the new Asian millionaires, who are the ones who take out the checkbook at auctions without worrying too much about the artist's career, trusting their expert advisers in the art world. If it goes well, without a doubt, Sanz will repeat.